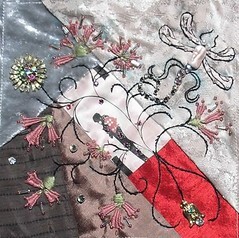 This is a little wall hanging I made with the blocks from a crazy quilting international round robin, Fans. 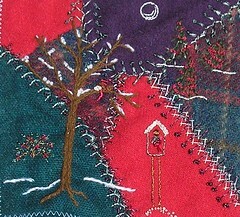 The stars here are the stitchers, Cathy Kizerian, Jo Nesham, Gerry Krueger, Bonnie Witt and Cobi Wittkoek. I trimmed them then set them in a border with a rich velvet. I hand dyed the lace......no, its not reallyyyy that orange.... and now have it happily displayed! Yeahhh!! Thanks again ladies for sharing of your wonderful talent! 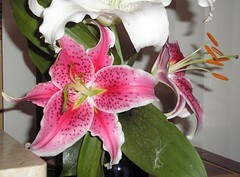 I just thought I'd share a pic of the gorgeous lilies I harvested from the garden today! Gorgeous, me thinks! 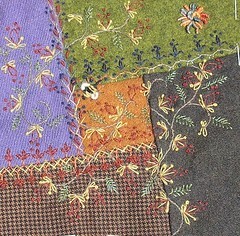 This is Cathy's block from the wool rr. She requested a christmas theme, so I gave her a winter tree, holly bush, bird and nest with stocking in the tree, a bird house with the wreath and a little forest decorated with cranberry garlands under the winter moon. I hope you enjoy it, Cat! In catch em up mode for posting.... this is Simona's block from the wool dyb, now flying home to her. 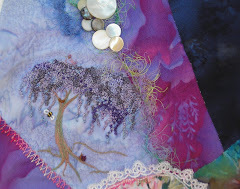 I have just finished Hideko's block for the art noveau rr.... I tried to keep it light and in keeping with the styles that she requested. There are several pieces of recycled jewelry used for sparkle as well! I hope you enjoy!